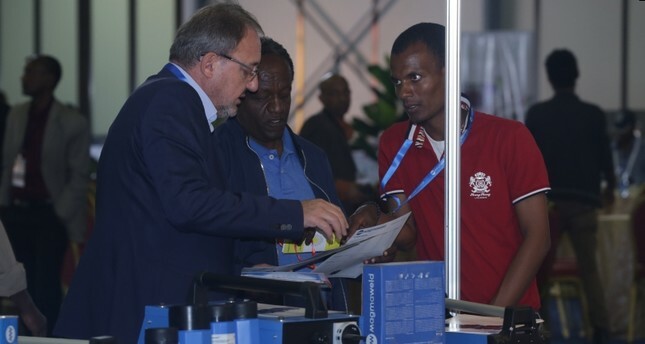 More than 70 Turkish manufactures displayed their products in Ethiopia's capital Addis Ababa in a attempt to boost their presence in the market. The 3-day exhibition is organized by Ladin International Fair and Congress Organization, a Turkish exhibition organizer, in collaboration with Ethel Advertising, an Ethiopian marketing and communication firm. Ethiopian president on Wednesday praised Turkey's opening policy towards Africa as it has helped both countries find mutual business opportunities with each other. "Turkey's strategic engagement with African countries to enhance the trade and investment with them converse with Africa's need to attract foreign direct investments," Mulatu Teshome told the Turkey-Africa Economic and Business Forum in Istanbul. Teshome said the event will take Turkey and Africa's existing economic and political relations to the highest level, while fostering strategic economic alliances as well as discussing, finding and providing solutions to the challenges in trade and investment relations. He also said with the presence of top government officials, the forum will have great influence on promoting the economic development of both Turkey and African countries. Cagatay Ersahin, Sales Director of Ladin International, told Anadolu Agency that the exhibition was the 5th edition of a permanent trade and business connection between the two countries. "Since the first exhibition in 2011, Turkish participation has shown a significant increase," he said. Among 100 firms participating in the exhibition, 80 are Turkish companies, he noted. Bilal Dasouki -- international sales coordinator for TUNAYLAR, a Turkish company which produces electronic truck scales -- said there had been a depressed market in Ethiopia since 2016 due to the civil unrest. "But now things are improving and we hope that we do a good business as we are doing in North Africa," he added. Mevlut Dukmen, a representative of GMA Machinery Company, said that the Ethiopian construction market provides huge opportunities for various machineries the company produces. "We have made four years of market research in Ethiopia, and Ethiopian construction firms have begun looking for our machineries […]," he said, adding: "We are hopeful that in the coming years, we will be a dominant brand in the market." More than 187 Turkish companies have an investment nearly $3 billion and have created more than 30,000 jobs.